Introducing our NEW Five-A-Side League for U8 and U10 teams - Similar to Futsal in many ways, similar formations and similar size field, however the game is played on Turf with a regular ball. More touches on the ball, a faster game creating more goal scoring opportunities. Improve on your footskills and footspeed, develop your team play with quick passing and movement. Check out our NEW two field layout which allows parents to access the field for better veiwing (standing only) seats are located behind the goals. Five Star Soccer Academy is a "Non Boarded" facility re-turfed for the 2018 season. the main field is a huge 200' x 96' lined so the U12 and U14 formats increased from 7 v 7 to 9 v 9. Unfortunately we will no longer allow outdoor cleats on the field, we will accept TURF shoes, INDOOR soccer shoes and SNEAKER type shoes. 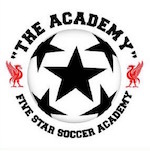 Welcome to Five Star Soccer Academy! Five Star Soccer Academy is conveniently located on Main Street, Route 12 in Oxford Off 395 - just minutes from Worcester and the borders of Rhode Island and Connecticut. Here we will introduce our facility and give some examples of the types of activities we're involved in, you can also check the weather and get directions right from your door step. We run leagues for all ages and abilities from U8 to over 40, boys, girls, men, and women. Premier teams, rec teams, as well as town, tournament, and pick-up teams.